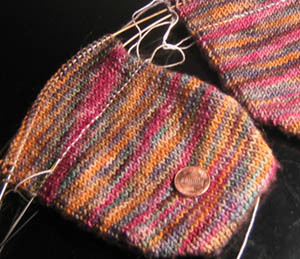 It was impossible to pick out the toe of the socks, so I frogged them (rip-it! rip-it!) and started over. This time I’m also carrying along a strand of reinforcing wool/nylon for the toe. Toes of steel! Mom will be able to kick some serious booty without worrying about her footwear unravelling. The only issue is that now I wonder if it’s too narrow. 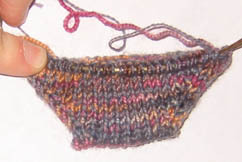 I used the magic cast-on from Knitty and cast on 18 stitches – 9 top needle and 9 bottom needle – and began increasing every other row as indicated by that cast-on. However, it looked like it was too pointy, so I started doing an increase, increase, straight pattern of rows instead. So now it’s got kind of this flower-basket thing going on at the bottom. As long as it fits, I don’t care if it looks a little funny, because it’ll get stretched when it’s on her foot anyway. It’s a blurry picture, but you can still see where the socks are in relation to my foot. It’s hard to gauge whether it’s as it should be, because my toes are really significantly wider than hers are. And I’m not up to the total number of stitches for the body of the foot (which, by the way, I’m dropping down to 54 from 60 this time). So maybe I should just keep knitting and see what happens. I would just hate to have to rip this out a second time. Not because I don’t want to do the work again, but because I don’t want the yarn to get all fuzzy. I’m going to post this to and see what they may have to say. 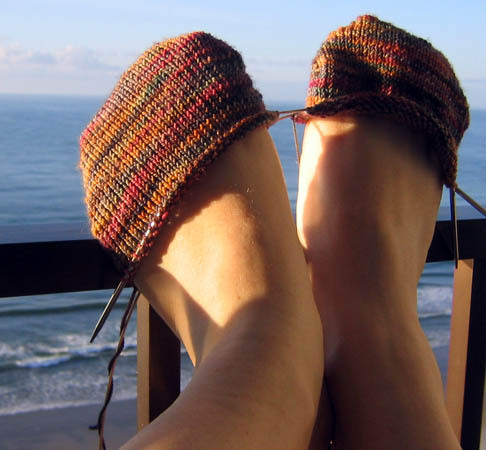 If you’ve knit socks before, I’m open to suggestion and comment. Otherwise… well, I guess we’ll just see what happens! 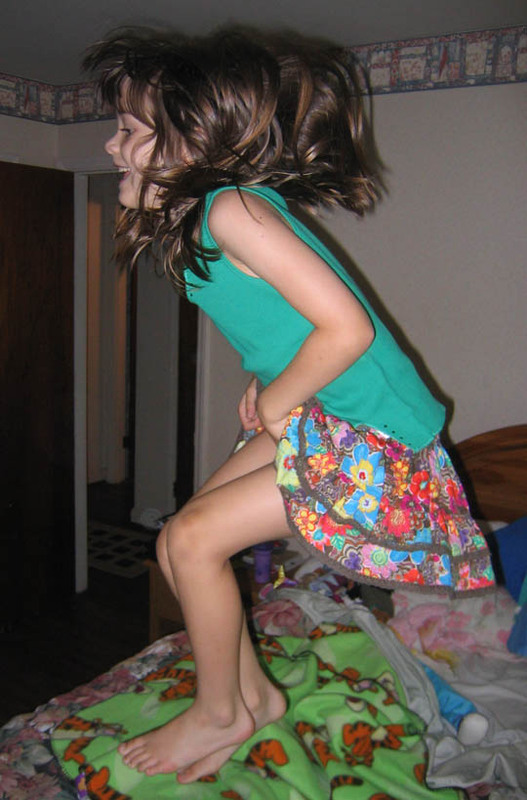 Tonight at about 8:30, just as daylight is fading, my daughter gets out of bed and opens her door. She’s holding a tiny book of funny things kids say, like you’d pick up at the register of a bookstore, titled “What We’ve Learned So Far.” And what’s so urgent as to pull her out of bed? My daughter was reading in bed until the last possible minute and got up to ask me what “dissect” meant. I love it. …and his name is Jimmy Hoffa. The hubby took our daughter to his workplace, and they looked out the 3rd floor window at a big construction site across the road. They’ve excavated down several stories in preparation for putting in a huge underground parking garage. The pit is very, very large. Hubby: Look at that great big hole! Daughter, matter-of-factly: It’s for putting someone in. Either that’s one big person, or that’s somebody you really don’t want to get out. Spreading the gospel of knitting. 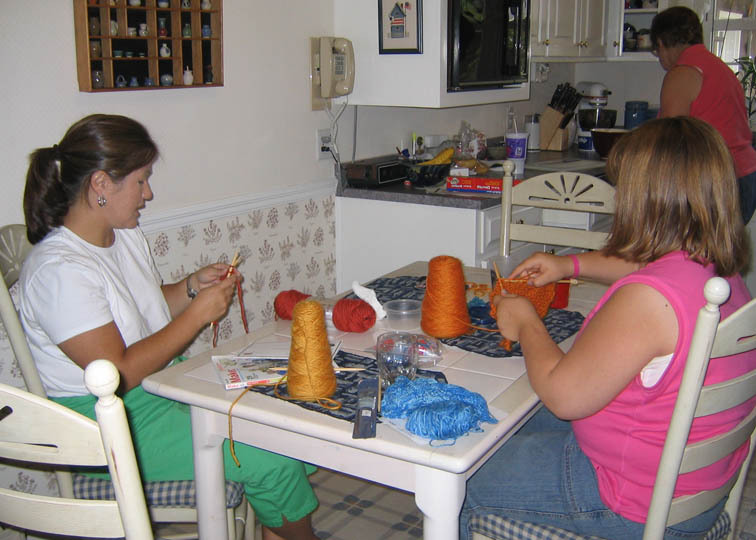 So last year, over the July 4th holiday, I posted that I’d taught my sister-in-law and my niece to knit. That’s my niece on the right. 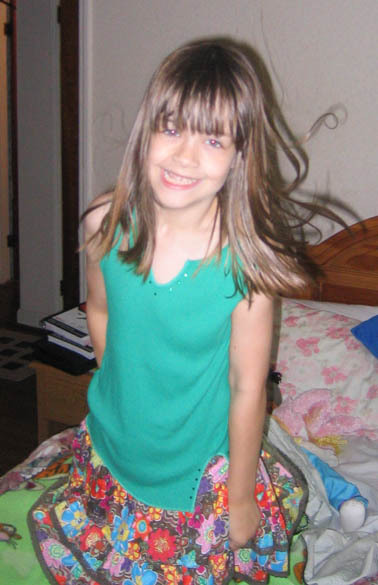 She was 13 then. Fortunately, I brought extra Jayne yarn that weekend – the production line never stops! I saw her a couple of weekends ago on the way to the beach. She happened to be visiting my husband’s folks when we dropped by. Turns out she stuck with it! She’s made a teddy bear for her mom, and is making another for her mom’s roommate. And she’s already getting that thing that experienced knitters get when everybody suddenly wants a hand-made gift but has no clue about the amount of time and effort that goes into it. It’s a kind of a roll of the eyes. Of course, all teenage girls learn that roll of the eyes, so maybe that doesn’t mean anything. Anyway, she’s very proud of herself, and I’m proud of her too. I’m going to send her more yarn, and maybe another book. I wonder if she’d like to try felting. Any thoughts or recommendations? I’m not sure how advanced to get. I don’t think she’s working on circular needles. Hmm. I’m thrilled that she’s doing this. There’s a special pride that comes from knowing that you can make something really cool with your own two hands. That’s got to be good for a kid to have. New Futurama is on the way! Looks like I’ll be bumping back up to the next tier of cable channels in 2008! 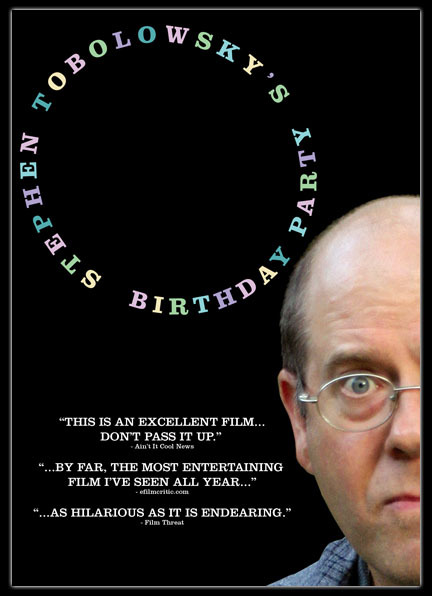 The hubby and I finally got a chance to watch Stephen Tobolowsky’s Birthday Party last night. Excellent movie. Highly recommended. Packed with extras, too – there are gobs of additional stories. Even though I told the hubby that the extras would still be there tomorrow, he really wanted to see them all last night (this is unusual for him). He woke up this morning, bleary-eyed, hanging his head down and muttering, “Curse you, Tobolowsky!” So there’s a ringing endorsement from us both. In DR news, I put in some moon mage visions, looked for some tattooees (I’ll look again tonight), did some paperwork, hid a Real Gem, tested a thingie in Plat, and generally did the little stuff that needs doing on a regular basis. I’m hoping to schedule a (REDACTED) at the (REDACTED) sometime in the (REDACTED), which I’m sure will be (REDACTED). Isn’t that (REDACTED)? I thought so too! 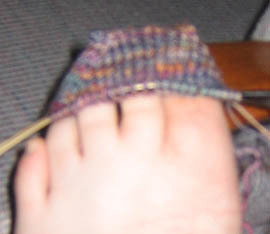 On the knitting front, the toes in the socks are just too dang wide. They fit me like a glove, but of course, they’re not my socks. I’m going to try to rip out the toes and make them narrower. If that doesn’t work… I’m starting over! And this is why every non-paid gift I knit takes forever and a day. I’d rather have it right than quick. My mother is no doubt muttering (REDACTED) at the monitor right now. Sorry, Mom! 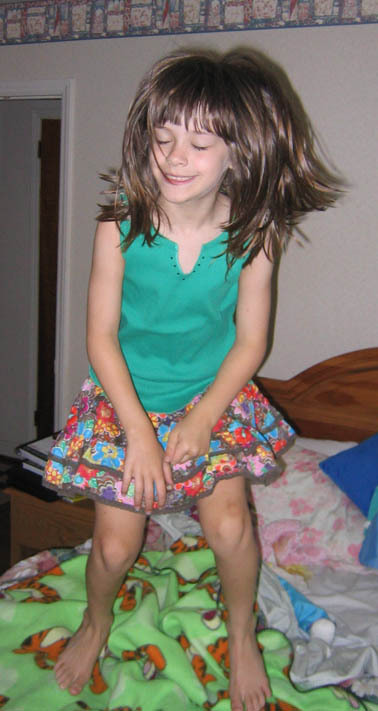 But then, when you catch her in a natural moment, it’s wonderful. Of course, we’ll need a new bed after this, but that’s a small price to pay. Jayne hats on the needles for Ohio, then Florida and Virginia! And I call myself a GameMaster. the Sword of Tribanin and 0 gold pieces. How embarassing. I managed to flee from the minotaur, at least. And that sword I found didn’t do jack. Thanks a lot, . the Wand of Scaredkat, the Sword of Tribanin, a Figurine of Gmaurdun and 28 gold pieces. Crap! Turned to stone by the cockatrice. What a way to go. June 24th, 2006 admin	Enter your password to view comments. We have got to do that again next year. A guy who lives out west ordered a Jayne hat from me this Spring, only to have it turned back TWICE. 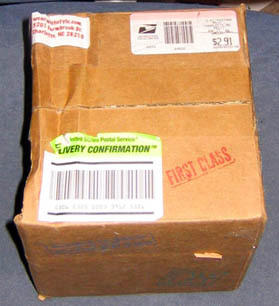 The first time, it actually was apparently delivered, but for some unknown reason it was returned to me, heavily mangled. After talking with him to be sure the address was correct, I mailed it out to him again last Thursday. It just showed back up on my doorstep, only lightly mangled, but missing the address label. If it hadn’t had a little “custom made for ____” label tucked inside, I wouldn’t even have known which hat it was. The delivery confirmation number shows that it never even made it out of Charlotte this time. WTF?? I’m fairly certain that the original Jayne hat, travelling across the vast reaches of space, didn’t have this kind of trouble getting to Jayne. What’s a guy gotta do get a cunning hat around here? I’m leaning towards space monkeys being involved somehow. I’m shipping it again, priority. Un-freaking-believable. In other news, we’ve got our sitter lined up for the Serenity screening in Charlotte tonight. The Observer ran a blurb on it yesterday, and I hear through the grapevine that at least 50 tickets have been sold, meaning the screening broke even a few days ago and is now making money for its charity, Equality Now. I can’t be there to help with the set up, so I hope the people doing it remember little details like to bring extra one dollar bills for change. I’m not sure they can process credit cards at the site. Some folks are coming down from Raleigh for this. I anticipate a good time had by all – even you, ! 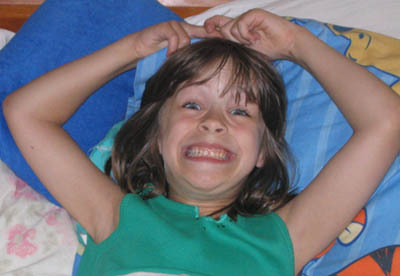 Well, I spilled the beans to my mom as to what the present was, so I can post freely. I asked her to try these on, and while she does have wide feet like me, these looked a little too wide to my eye. They’re probably okay across the ball of the foot, but they need to be narrower further back on the foot. So I have put in a lifeline, pictured to the right, and am about to rip back to that point and do a slight decrease. These felt okay on me, but my mom’s a full size smaller than I am. It’ll be interesting to see what effect a different number of stitches will have on the pooling that’s starting to show up. I’m betting it’ll be more pronounced, but whatcha gonna do, eh? We’ll see. On a totally geeky note, while I was in Myrtle Beach, I found The Living Room, a little coffee shop/used book store that made a great cuppa joe. I looked at the shelves while I was waiting for my coffee, and saw something that made me laugh out loud – I had to have it! Holy moly! I didn’t even know they made these! I remember playing Zork from Infocom in college on my Mac Plus. 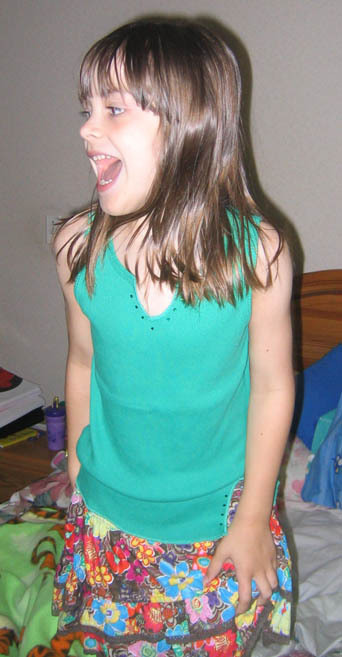 Ah, those were the days. I loved all those Infocom games. It’s a straight line from these single-player text games to my involvement with Dragonrealms. I once got so stuck on an Infocom gagme that I had to call the eighth grade little brother of a dorm-mate I barely knew to try to get tips on a particularly tough puzzle. He totally understood why this strange 20-year-old college girl was calling him, as any good geek would. 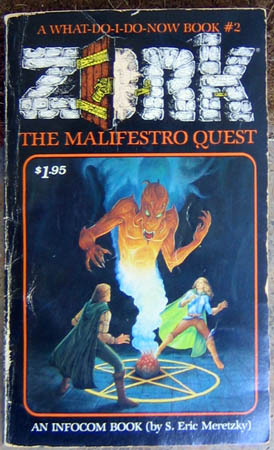 And like most grownups of my age, I remember “choose your own adventure” type books where you’d select one of two outcomes and turn to the page for that outcome to continue the story. I just had no idea that the two had come together in this happy congruence. And written by Steve Meretzky, no less! This may not mean anything to anyone, but boy, those Infocom games will always have a special place in my heart. A special place in my closet, too – I still have the original Infocom games in their packaging, complete with the peril-sensitive sunglasses in Hitchhiker’s Guide to the Galaxy which is now available to play online. By the way, the original Zork text-based adventure games are available for download here if you’re in the mood for a trip down memory lane.